Anesthesiology Research faculty and staff held an open house in its newly renovated laboratory space. The new space offers advanced technology for studying brain activity and how the brain responds to therapies. 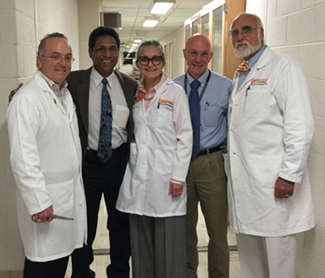 A ribbon cutting was held including Robert Craft, MD, Chair; Subimal Datta, PhD, Professor; Helen Baghdoyan, PhD, Professor and Co-Director; Ralph Lydic, PhD, Professor and Co-Director; and Mitchell Goldman, MD, Assistant Dean for Research. See more photos of the open house on Flickr. Second-year Internal Medicine resident physicians Aimee Wehber, MD, and Amar Parikh, MD, won awards at the Tennessee Chapter of the American College of Physicians meeting. Dr. Wehber won first place for Original Research/Quality Improvement for "Improvements to House Staff Medicine Inpatient Service Using Lean for Healthcare Principles." Dr. Parikh received first runner-up for his oral presentation, "Duodenal Gastrointestinal Tumor Mimicking Pancreatic Neoplasm." Kimberly Fortner, MD, Associate Professor and Medical Director of Obstetrics and Gynecology and Director of the Division of Maternal-Fetal Medicine, has been elected to serve on the Infectious Diseases Society for Obstetrics and Gynecology. She will serve a three-year term on the council. According to IDSOG, there are currently 120 members from the United States, Canada, Europe, and Australia who represent academic senior faculty and research scientists in leadership positions at local, regional, and national levels. Members of IDSOG have published more than 5,000 scientific articles as well as numerous authoritative texts and chapters that serve to influence the national standard of care. The course culminated in the presentation of a new research study that the fellows designed over the course of the week as the respective topics were presented. Keith Gray, MD, MBA, has been selected to join the 2016 Class of Leadership Knoxville’s Flagship Program. Leadership Knoxville is a 10-month educational experience designed to further develop and enhance personal leadership skills. This program explores arts, education, economic development and government, all while discovering the area’s greatest challenges and opportunities.